The packages of the Ford Ranger are the Sport Appearance Package and the Chrome Package. These features come with a sporty appearance for the sport package and the chrome appearance for the Chrome package. This will give you an added sense of style for your vehicle. 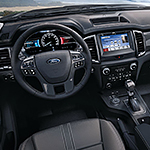 To go along with the Ford Ranger is the set of accessories that you can choose from. These accessories such as the carriers and racks will not only give you an extra sense of power to carrying items, but also an extra bit of style.